Last week shot a video doing a short walk around test with majority of costume on. I didn't put on belt, arms or gloves just yet. The mask is almost done. There is no sound on the video. Monday I received a microphone and personal amplifier in mail that I ordered on newegg.com. It is a small 10watt amp speaker with headset mic and rechargeable battery. The amp will fit inside the chest piece just behind the license plate where I have a hole cut away. I will figure out a way to affix the mic to inside of helmet and remove the head wire that came with mic. I had to modify the missile launchers. After a partial dress rehearsal with walking around, I don't have much room between the helmet and missiles. Thankfully the mounts I acquired at Home Depot have adjustable angles. I basically pointed them down just a bit and outward to the sides, for more room around helmet. Applied leg fender decals and lettering tonight. The right forearm is finished. 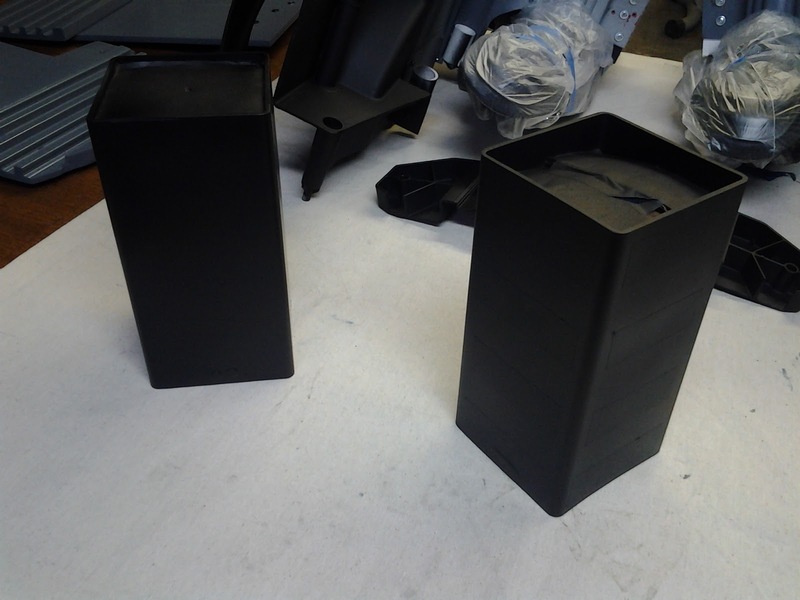 Finished riveting outer plastic panels onto forearm box. Used some old t-shirt sleeves with elastic for inside wrist cover. Riveted both sleeves on inside of arm box. Adjustable nylon strap to secure forearm box onto my arm above elbow. The white sleeve will cover nylon strap, roll up arm and then stay tightened under shoulder mount strap. When not in use the white sleeve will act as cover to protect outer forearm plastic from scratches. Used 3/8 cushion foam with adhesive backing, on the inside of forearm box for a comfortable form fit around my arm while wearing it. 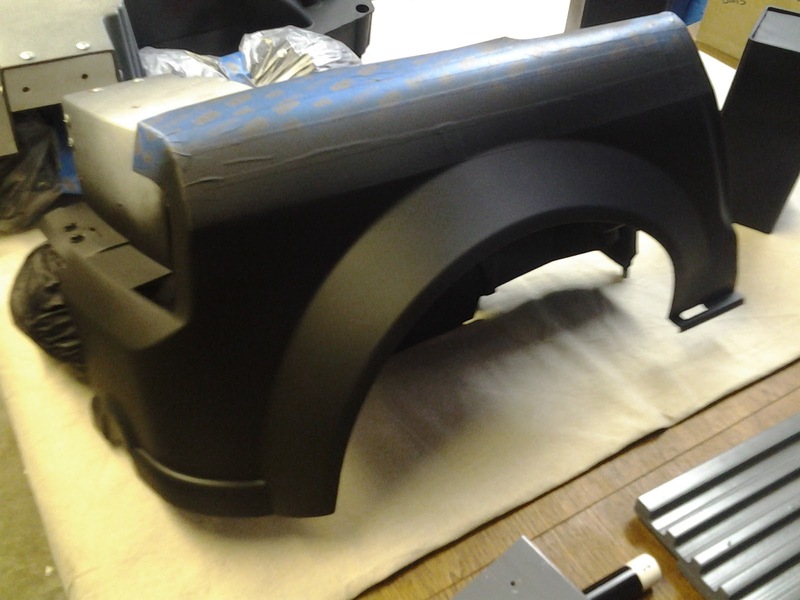 The clear coat dried so I assembled one of the lower leg fenders today. Attached the wheel shroud inside with another separator and riveted them in place. Tail light and spoiler fin attached. Rear window attached with protective film still on to prevent some scratches until day of event. Riveted on the knee guard into place. The entire fender looks great completely assembled. 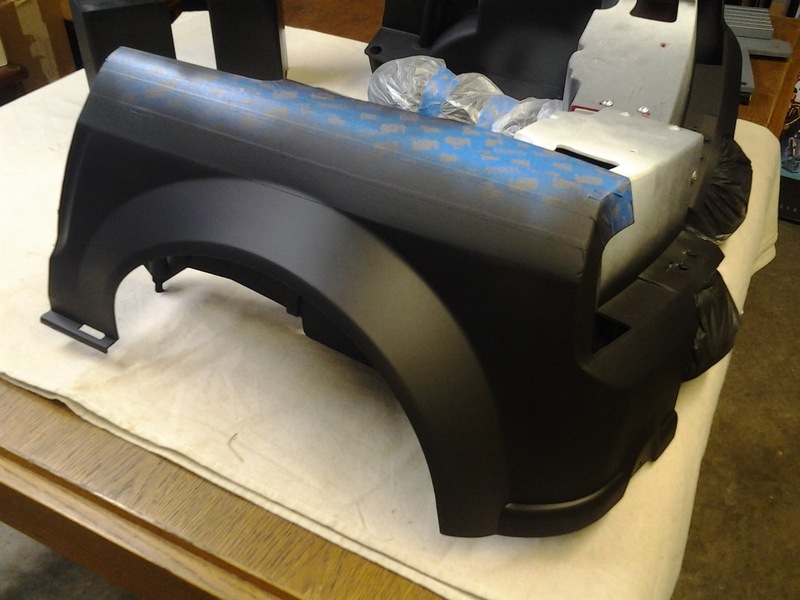 Spray painted the forearms and added a second coat of black to lower leg fenders. I still have more to complete on forearms by adding on the outer gloss plastic panels. Think I will rivet the forearm panels on rather than glue and then get some black nail polish to touch-up exposed rivet heads. Should have leg fenders done with clear coat enamel by Thursday and then will do a complete assemble by Friday. I will try and do a video this weekend with what I have assembled and try everything on to see if any adjustments need to be done.